The Worst Foods for Acne - Does Your Diet Effect Your Skin? So, you’re doing everything right. You’re washing your face twice a day, removing all your makeup, not wearing that heavy foundation anymore. But you’re still getting breakouts. 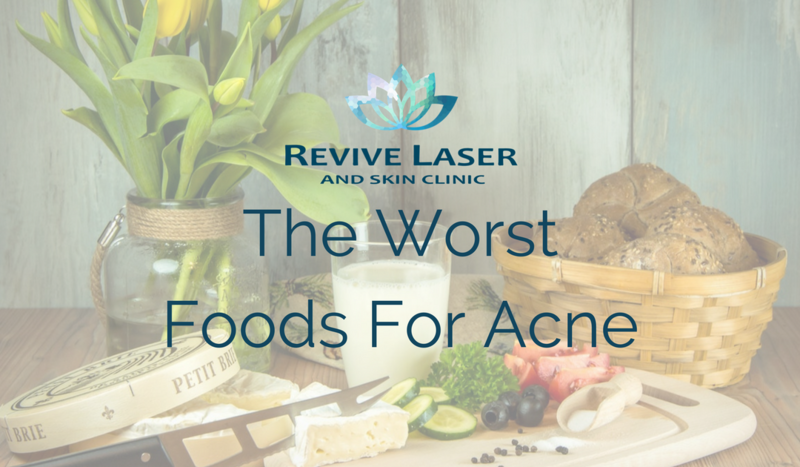 Before resorting to harmful medications like Accutane, think, are you eating the worst foods for acne? Let’s try adjusting your diet first! When there is inflammation inside the body (meaning the body is unhappy), one of the first places to show it is the skin. Other signs can include headaches, other skin problems like Eczema or Psoriasis, as well as many different digestive issues. Our recommendation is to try elimination diets to see if there are any dietary triggers for your acne. This can be done under the expert guidance of a nutritionist or naturopath, or you can try saving some money and begin experimenting with the most common trigger foods yourself. The best way to do an elimination diet is to completely eliminate these foods completely for a few weeks. No cheating. If you cheat, you need to start the experiment all over again. You can then slowly begin introducing them back into your diet one by one, several days apart. If your skin clears up during the elimination period then begins to worsen after bringing back one of these foods (or all! ), you will have your answer. I know, this sounds awful and you’re probably grumbling already. Who doesn’t love cheese? But this will end up being a struggle of priorities. Which is more important to you, clear skin, or the cheese on your pizza? The reason dairy contributes to a whole host of annoying problems is the hormones. An average glass of milk can contain up to 60 different hormones (it does come from a recently pregnant cow), which in some people, can throw their own hormones off balance and cause all sorts of issues with the body, like acne. Typically, dairy from goats isn’t as inflammatory as cow’s milk, so cut out all dairy at first and try adding back cheese like goat cheese and feta. Some yogurts are also not an issue even for those with dairy intolerances. Besides the obvious sources of sugar like candy and alcohol, foods that are high on the glycemic index (raise blood sugar levels) like white breads, pastas and cereal, potatoes, etc. can also raise insulin in the body and mess with hormone balances. This can change the body’s oil production in the skin, which leads to breakouts. Replace white potatoes with yams and white starches with foods made from brown rice, whole grains, and quinoa. There is good news for chocolate lovers though, in the past chocolate was thought to cause acne, but it turns out it is more likely the sugar in the chocolate. Try dark (80%) cocoa chocolate with no (or little) sugar added, which is also an antioxidant! For a more detailed list of where foods fit of the Glycemic Index, click HERE.